All the taxpayers who have NIL tax liability can escape from deduction of tax on the interest by submitting Form 15G or Form 15H (as applicable) to the deductors such as banks, post-offices, companies etc. at the beginning of year. Remember both Form 15G and Form 15H have validity of one financial year and is required to be given each year for avoiding tax deduction. How Form 15G or Form 15H can be submitted? When to submit Form 15G or Form 15H to avoid TDS deduction? Form 15G and Form 15H is an intimation to the income provider for not withholding or deducting tax (TDS) on certain incomes. These forms can only be provided for avoiding tax deduction on PF withdrawals, Interest (Bank, Post-Office, Company deposits, NSS) and Dividends. These Forms have to be filled in two copies, one of which is to be submitted to the deductor/payer while taxpayer shall retain one copy for his own record. His/Her total aggregate interest income for which form 15G is given shall be less than maximum exemption limit of Rs.2.50 lakh (FY 2015-16). His/Her total tax liability is NIL for the concerned financial year. The amount of interest income for which Form 15H is given is irrelevant. NRIs, Firms and Companies cannot submit Form 15G or Form 15H. Form 15G or Form 15H can be submitted in physical mode as well as online mode through the web portal of deductors however, not all deductors accept online submission. So it would be wise to submit it in physical mode. Despite of submission of correct forms at correct time several complains of deduction of taxes have been registered, so to overcome the increasing cases of wrong deduction of taxes, RBI has directed all the banks to provide acknowledgment at the time of receipt of form 15G or form 15H. Tax at Source is deducted (TDS) when the interest income exceeds the threshold limit of Rs.5,000 or Rs.10,000 if the payer is bank. Ideally you should submit PAN copy along with the Form 15G or 15H, (failing which the deductor will deduct tax at 20%) at the beginning of the financial year to avoid tax deduction. Many people think that TDS is not deducted on interest on fixed deposit or time deposit with tenure of more than 1 year but it?s not true. Bank deducts TDS on the interest amount on yearly basis if exceeds threshold limit of Rs.10,000 per bank branch for the bank with core banking, otherwise the threshold limit of Rs.10,000 is to be considered per bank branch. Your maturity amount will be net-off tax amount i.e. principal amount plus interest amount less tax. 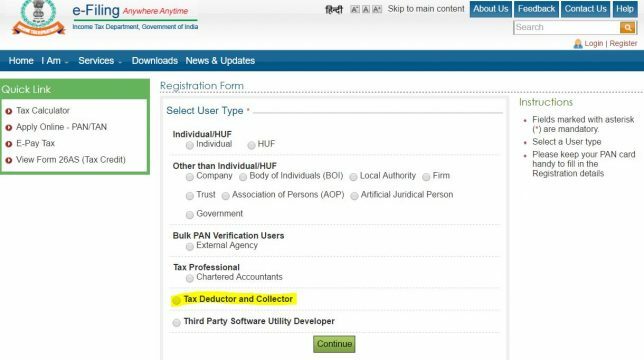 Recently Apex Body CBDT has made necessary for all the tax deductor to get them register on e-filing website as ?Tax Deductor and Collector? and submit a ?Statement of Form 15G/15H? together with TDS Return. Tax Deductor is require to allot a unique identification number to each declaration received by him during the year and prepare XML file using utility and submit it on quarterly basis using Digital Signature Certificate. In case you have not filed form 15G or form 15H with the deductor than you have only one option to get back your money and that is by filing ITR and ask for refund. Even late filing would result in same unless your deductor deducts and submitted tax to the Government on your behalf. A false or wrong submission of form 15G or form 15H would attract penalty or imprisonment up to 2 years under section 77 of the Income Tax Act. So please fill the applicable form and submit along with PAN copy to the deductor as soon as possible. I. Received form H from SBI.But there is no columns for AC no. Or FD NO.FOrm is not clear or user friendly.And no proper guidelines about it.How layman can fill the form properly.? There is no column for PAN card.and all person can not do it online.kindly make it user friendly.senior citizens who are not getting any pension will be in loss. I am harassed by my bank SBBJ, which despite timely submission of Form H, deducts tds arbitrarily on TDR monthly interest income in April and no cognizance or notice of customer complaints, in person contact and written applications is taken repeatedly. TDS is also farcical in that it is done for only one tdr and is not even 10% but just 1%. Unique identification number never given for the form to any client so that refund cannot be claimed from Tax department, the amount being less than Rs 100/-. Moreover, the manager indignantly in insulting tone says I am creating fuss for a petty sum!